Symptom Checklist | Bite Me. Lyme Disease is a tricky little @#$!. It enjoys a good, ongoing game of hide-and-go-seek, hiding in your organs, tissues, blood and bones. The ‘great imitator’, is, naturally, difficult to spot. Once the symptoms pile up, it is difficult to see the forest for the trees. 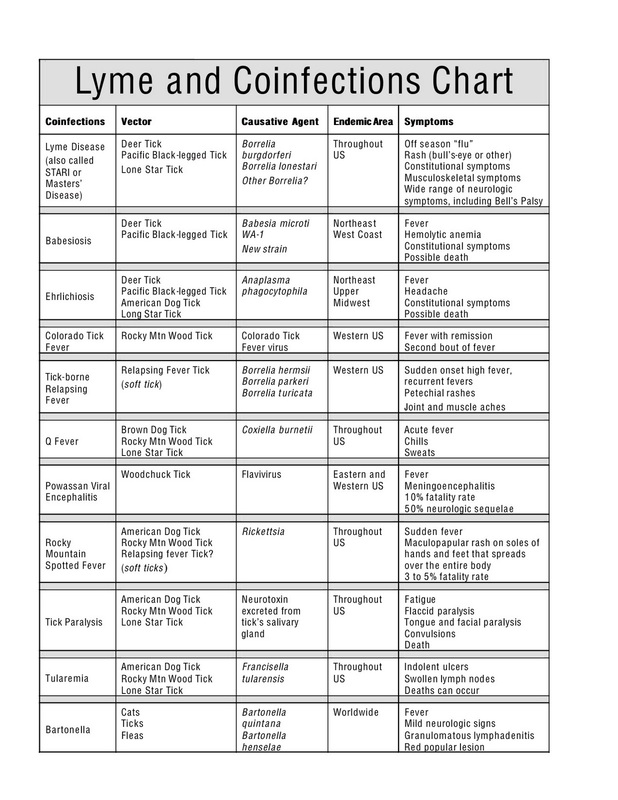 The CanLyme website is an absolutely fantastic resource, and I pulled this list of Lyme symptoms off it, and used Joe the Tick’s Lyme Blog, and excellent source clear information of tick-borne illnesses. Check out this clear chart of symptoms here, or read below checklists from various sources! If you have more than 20 of the following symptoms of Lyme disease, there is a serious potential that you indeed have Lyme, and proper testing is required. I know the list is daunting, but it is well worth your time. My mother printed off a similar list and too it around to all the doctors I saw, with more than 2/3 of the symptoms checked off. It is great to have as a handy resource. Make sure to take your time when answering the questions, thinking about your whole life too, not just your more recent symptoms. Once completed, if you have more than 20 ‘yes’ answers, there is a serious potential that you have Lyme disease, and I would urge you to get a Lyme diagnostic workup and see a doctor in the know pronto! Please don’t wait, for your sake. I have also included the checklists for Babesiosis (babesia), Ehrlichiosis, and Bartonella, 3 of the most common co-infections that are also carried by ticks. When you are bitten by a tick, there could be any number of different diseases floating around in their body that they can pass on to you. I would recommend that you look at all 4 lists, just to insure you aren’t missing a piece of the puzzle. Unfortunately, most people who I’ve met who are very sick have multiple co-infections. The symptoms of babesia and bartonella I experience cause me much more grief than even the Lyme disease. Many of the symptoms overlap for all 4 diseases, but knowledge is your best weapon in fighting them. Your LLD (Lyme Literate Doctor) will understand how to diagnose these properly, looking primarily at the symptoms (but also at accurate testing). If you are looking to research more about how complicated co-infections can manifest in your body, check out this incredibly detailed look at most of the co-infections on CanLyme’s website. 73. Early on, experienced a “flu-like” illness, after which you have not since felt well. 15. Nerve irritation symptoms which can be described as burning, vibrating, numb, shooting, etc. Check out CanLyme’s page on co-infections and the poster below from lymedisease.com.